Did you know that RSX stands for Rally Sportscar Experimental? When you own an Acura RSX, you’re just not doing it justice if you don’t have an Acura RSX subwoofer enclosure installed. Sports cars are purchased for their high-quality performance, their sleek, enviable lines, and their impressive ride. People who own the Acura RSX know what it means to own quality, beauty and great styling, and to further those initiatives means to get an RSX subwoofer box installed. You might not realize it, but by installing an Acura RSX subwoofer, you’re greatly enhancing the sound quality that comes with your existing, factory-installed system. 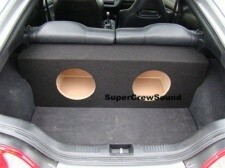 These subwoofers install in just minutes and can fit right into the trunk opening. At SuperCrewSound, we offer a 100% Perfect Fit Guarantee, so you don’t ever have to worry about always getting the very best sound out of your Acura RSX Sub Enclosure. In fact, if it doesn’t fit, we will refund your money. Since we are experts in this industry and we specialize in custom built subwoofers, we can make this guarantee where are competition simply can’t. Your Acura RSX deserves a hyped up stereo system, so why wait? Contact the expert team at Super Crew Sound to find out how you can go about getting your Acura RSX sub enclosure installed, when you’re thumping down the street in your “new” tricked out Acura, you’ll be so glad you did!